A proposal by the Federation of Indian Associations of Victoria (FIAV) to install a life-size statue of India’s Father of the Nation, Mahatma Gandhi, opposite top Australian city Melbourne’s Dandenong Station, adjacent to Little India, Foster Street shops, has been shot down in a community consultation survey, which closed on June 7, 2018. More than 900 people participated in the survey, commissioned by the Dandenong Council with more people saying no to the proposal. The survey information and other matters came up recently before a meeting of the Indian Prescient Task Force led by Gabrielle Williams, MP, Dandenong. When contacted to know about the outcome of the survey, Dandenong Council’s Anya Murray told South Asia Times (SAT) that the information collected in the survey has been submitted to the Indian Prescient Task Force for a decision, and the Council is likely to issue a media statement on the issue in a few weeks in August 2018. Another proposal to install a statue of Basava, 12th-century Lingayat philosopher and social reformer, also did not succeed at the Task Force meeting, even though this was not part of the Council survey, SAT report says. 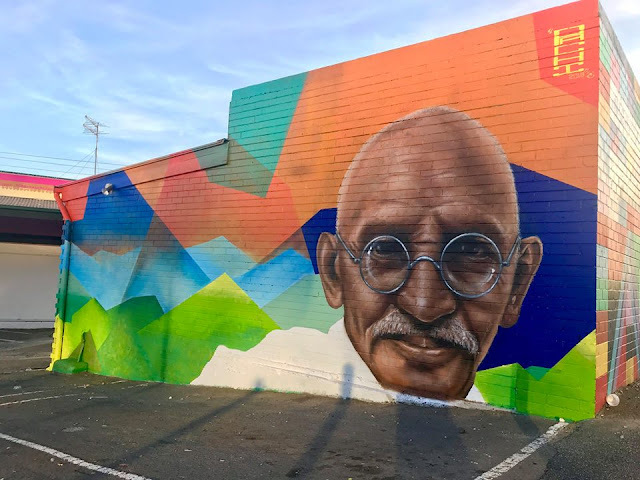 Interestingly, three large-scale artworks, including one on Gandhi, were commissioned and completed by the Dandenong Council in Little India, Foster Street, to celebrate the Indian and subcontinent flavour of the area. Only recently, the Immigration Museum with the support of the state government hosted an exclusive exhibition Mahatma Gandhi: An Immigrant, an interactive exhibition, which remained open between April and July 2018. The highlight was the visit of Gandhi’s granddaughter Ela Gandhi, a former member of parliament, in South Africa.